How smart is your smart watch? Casio and Fitbit have jumped on the smart watch bandwagon. But for the technology to take off, it will need to be much more than just a phone strapped to your wrist. Though certain people hold some of Casio’s older watches in great affection, the Japanese firm is moving with the times. It’s unveiled its first smart watch, which it’s calling the WSD-F10 Smart Outdoor Watch (the creative juices were apparently running dry on that brainstorming session). 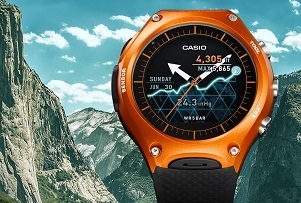 Rather than going head-to-head with the Apple Watch or some of the snazzier Android Wear devices, Casio is playing for a niche it cornered long ago – the rugged outdoors. While the WSD-F10 runs Android Wear and has numerous apps and sensors as you’d expect from a smart watch (accelerometer, heart rate monitor etc), it’s also resistant to shocks, dust and rain to US military grade specifications. Even the battery’s hardier, lasting up to a month between charges. It’s clever move, firstly because it avoids a foolhardy head-to-head with Apple and Samsung and secondly because it focuses on something that you can’t already get from your phone. If the smart watch is merely a phone strapped to your wrist, it will never take off. Saving yourself the hassle of reaching into a bag or pocket isn’t worth having to use a tiny screen or the ignominy of shout at your wrist every few minutes to pick up emails. Indeed, MT was talking about a 'phone watch' back in 2001, and it still hasn't taken off. But if smart watches can offer something meaningful that a smart phone can’t – in Casio’s case toughness during sports or in difficult outdoors conditions, but more broadly any function that’s possible only because it’s a wearable – then it has a future. It’s something Fitbit would do well to consider. The leading fitness tracker also unveiled a smart watch this week at CES 2016 in Las Vegas, the Blaze. The difference is it opted not to use Android Wear but instead to create a bespoke operating system. Stock in the firm promptly fell 18%, though that may have something to do with it looking like – to quote one MTer – ‘something you’d be given in a hospital in 1980s Russia’. One of the reasons for Fitbit’s success has been the fact that it does what it does well, without trying to be a magic miracle box. If people want to do a bit of everything on the move, they’d just use their phone. The firm would perhaps be wiser to stick to its strengths and invest in acquiring apps to integrate into the Fitbit ecosystem, rather than competing with the Apple Watch for a market that’s already looking like it will be a lot smaller than the tech world pronounced it would be two years ago.